Square Enix is cashing in on the Deus Ex fervor and has created an official clothing line based on the game. As you may have seen, Deus Ex: Human Revolution is a pretty darn good game. Square Enix clearly knows when it's got a major hit on its hands, and it's starting to roll out tie-in merchandise to take advantage of this. First up: an official Deus Ex clothing line. The clothing line is being produced by Musterbrand LLC, the group that also produced the Metal Gear Solid: Peace Walker line of clothing for Konami. 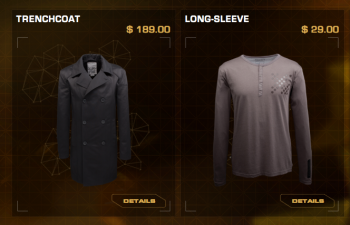 Currently the Deus Ex clothes include a total of seven different pieces, including some nifty T-shirts and a trenchcoat that happens to look surprisingly sleek. Of course, the different articles of clothing are a bit on the pricier end of the spectrum, but not outrageously so. The online store is officially open. Whether or not there will be additional pieces added to it remains to be seen.